This is a cute alternative to a regular movie night. Located on the rooftop of the building, you're seated in comfy beach chairs and are given headphones to listen (and adjust the volume). There's a bar, popcorn/candy stand and a burger (including veggie burger) stand as well. Outdoor movies are one of the things I associate with L.A. Living. I've been to a few events out in a park. The Rooftop Cinema Club takes it one step further and provides the chairs, blankets and headphones that help you hear every detail. They even provide drinks, including cocktails, and food for sale. I attended once and it started raining during a movie. They didn't even miss a beat before handing out rain ponchos to the entire audience. I went to the Rooftop Cinema Screening at its Downtown LA location, LEVEL. The rooftop itself was a fourth floor landing area, not at the very top of the building as one might assume. They also only had one food vendor (a lobster roll place) and a small concessions area, which was a little disappointing for someone expecting more options. However, the quality of the film, headphones and service was fantastic! The blankets are a great addition, especially as wind picked up later during the night. The seats were comfy and it was overall a great experience! So much fun! I went last year with my girlfriend and we saw Trainspotting (obviously not the most appealing choice to most...but hey, her decision :)) and had a great time. The set up is amazing - comfy seats, blankets available, adjustable headphones. It really is an awesome experience and particularly fun for a date, surprise night out, or if you have guests in town. They have plenty of food for purchase as well as some drinks -- definitely expensive, but some nice choices. I'd very much recommend stopping by for a movie one night. Be sure to buy your tickets early as they sell out far in advance and also be sure to show up to your movie early to snag a good seat. Comfortable and fun, Rooftop Film Club is a great activity for date night or just a fun activity to do with friends. Unlike Hollywood Forever screenings, you're not packed in with 1000s of people, all fighting for lawn space, hoping morons in front of you don't try to skirt the chair rules. This is sane, civilized movie-going. The rooftop has a great vibe, being surrounded on all sides by Hollywood proper. You don't have to worry about noise, however, thanks to the headphones you're provided with to watch the movie. There's a bar on site, as well as food. Parking can be tricky, unless you're willing to shell out for a local lot or garage (I parked south of Sunset and walked up). The only snag with the event is food--make sure to arrive early if you want to eat there. On the night I went, the vendor didn't have enough people working, and at least one of them (the person taking the orders/explaining the menu, since the posted menu had no detail and misspellings) was high (or just incredibly incompetent). Getting food, including waiting in the very long line, and then waiting for food, took 45 minutes (not exaggerating). In order to get a drink, I actually had someone hold my place and went to the bar (which had zero line). All in all, great unique way to take in a movie in Hollywood, but you might be better suited grabbing food before making your way upstairs. Love this place. It's a great place to come with friend, on a date, or even solo. The headphones solve the problem of not being able to hear, while the seats make it so you can leave the movie without a numb backside. They show a mix of old and new films that you can enjoy from a view of Hollywood you probably rarely see. A fun activity for tourists and residents alike! 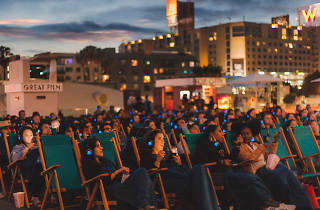 Rooftop Film Club takes advantage of LA's beautiful weather by screening outdoor movies from spring to fall. There are some serious perks to this event - your own set of headphones, comfy chairs, blankets, food and drink. It's like having a screening room in your own house...but you're on a Hollywood rooftop. I saw Sunset Boulevard here and it was a blast. I went to see Blade Runner with my friend and fellow blogger, and had a wonderful time! Not only was the movie great (believe it or not, it was my first time seeing it! ), but the atmosphere was something very rare and unique compared to the usual movie night here in LA. Love that they give you blankets if you're chilly, and that they sell food and drinks, as well as candy and popcorn right on the rooftop! Check out my burger and strawberry lemonade, as well as our popcorn in the photo I snapped during the previews! A couple things to keep in mind: The bathrooms are located a few flights of stairs down, and there is no other option but to climb a bunch of stairs to even reach the rooftop. There are some cool murals along the way, so check them out and maybe even Snapchat them while you get your workout in before eating, drinking and sitting in lounge chairs for a couple hours while enjoying the movie. Definitely also bring a jacket, since you can't take those fuzzy blankets with you on your way out. In addition to the bathrooms being far away, one other thing I didn't love is that of course you do need headphones (it's outdoors so there's a lot of ambient noise, of course)... but it also restricts you from whispering (very quietly!) to your friend or date if you're like me and love commenting (very briefly, I swear!) during movies. Still, I definitely recommend this for a night out with friends, or for a fun, unique date night! 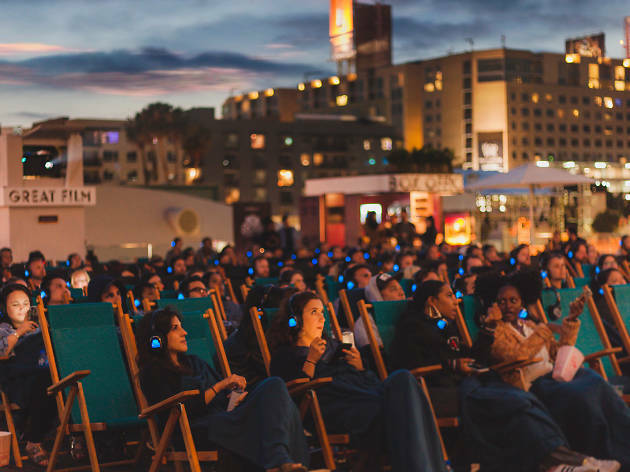 Hands down the best outdoor cinema in Los Angeles! This is the perfect place to go on a date or with friends!! Be sure to get there early for dinner and a glass of wine. Loved it... They are super friendly and have everything you need! This is LA's newest outdoor film screening venue and it's a blast! The chairs are comfortable, you can purchase cheap snacks along with alcohol and enjoy the movie through headphones so you don't have to be interrupted by people chatting. It's a great place for a date night! This is such a fun place to see a movie. It's right in the middle of Hollywood so you have some cool views of LA and it's just a cool atmosphere. The seats are really comfortable too and they have a great lineup of films!